I so look forward to growing as much Veg and Fruit as I can, in my first ever Greenhouse. Since joining today I have found a lot of brilliant advice, answers to questions I wouldn't have thought to ask, so that is good knowledge to know. I am just a bit stuck regarding planting Seed Potatoes. On watching a few online video's, before I had thought about joining a gardening forum - I saw a few different thoughts on planting them. One was to just plant them, eyes up, cover with soil of course, water them a lot, then take it all from there as they grow. But another idea I came across was for the seed potatoes to be divided. Mainly if one or more of the potatoes had more than 2 'eyes' on them, which several of mine have. This sounded okay to me as that would make more plants, but by dividing them I wondered will they produce as good like that, or is it for the best to plant solely the whole seed potato?. Also regarding what to feed them - Some said just water, some suggested using Tomato Feed as well. Any thoughts on the two questions please?. Definitely divide your seed potatoes. But you aren't thinking about planting them now are you? Potatoes are planted in early spring. We say plant potatoes when the forsythias bloom; if you don't have forsythia in the UK, that would be about a month prior to your average last frost date. I guess if you will be running heat AND lights all the time in your greenhouse, you could give it a try, but those will then be VERY expensive potatoes. From planting seed potatoes to having even small new potatoes is at least four months. Thank you for letting me know regarding to split the potatoes, I will well remember that. As you have also mentioned I would be best then not to plant them at this time of the year, as I have no intentions of getting heating set up in my greenhouse, or lights. Just I had heard that I could plant them now at end of August, and will have potatoes around December, that was why I purchased the seed potatoes. I fully accept what you have said, and I will not plant them now. I have bought seeds of various veggies already, those I intended to plant them when it is the time to do so. Our search engine is not very good, but try to look up Jal_ut. His experience shows if the the potato plant has many branches you will get many small potatoes. If the plant has few branches you will get few potatoes but much larger. 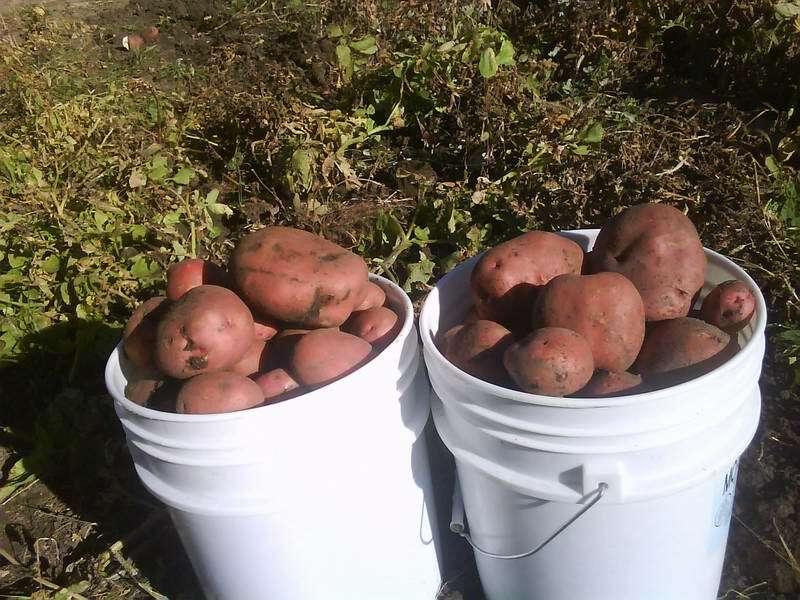 Your choice a dozen small potatoes or maybe four large potatoes per plant. So, Eric, do you agree with what I said about planting potatoes now in the north of England? It would seem like even if the weather is warm enough for them, the hours of daylight would be too short. But I've never tried fall potatoes, so I'm no expert. I never plant potatoes later then June. We are at less then 14 hours daylight and plummeting. Washington shares similar climate with England. DoubleDogFarm wrote: I never plant potatoes later then June. We are at less then 14 hours daylight and plummeting. I have been thinking about when it was suggested to me by an online friend, to plant the seed potatoes this end of the month, maybe they do that in the South of England where they live, but the more I think about it , as you have both said Rainbowgardener and Eric, even in the greenhouse it won't be warm enough at this time of the year. I will wait now until the weather warms again next year. I was also going to ask about Composting, but I have read a lot here on the forum, and learned a lot too, I have taken notes. Just wondering where it was also suggested to me to add Bonemeal and Miracle Gro, not too sure what to add it to, I gather to all the plants that I will hope to grow in my greenhouse. Bone meal (Phosphorus) is a very good addition to the potato patch. I will be trying Comfrey leaves next year. I can only tell you what I do with taters. Cut the potato to two eyes per piece. Plant in the spring. May 5 is a good target date for me here in Utah. 2 inches deep. Plants about every foot in rows spaced 30 inches. My soil is pretty rich in potasium and phosphorus, so I only add nitrogen. Yes do fertilize them. Also in the fall on my plot I add some manure, leaves, and compost. Till in the fall. Once the potatoes are up and growing good, I hill them so the tubers will not see the daylight. My plot gets deep watered once a week.